Authentic curries at school-dinner prices are the order of the day in this cut-price Indian dining hall. On this site for 60 years, the Indian YMCA sees little need to change a formula that has successfully fed generations of Indian students newly-arrived in the UK. The concrete and glass post-war modernist building looks institutional but is an institution, though these days you are more likely to share your table with a bargain-hunting British office worker than an trainee doctor from the Punjab. Queue canteen-style at the counter, while checking off the low prices on the pegboard menu above; ‘tin fruits 75p’ is typically succinct. 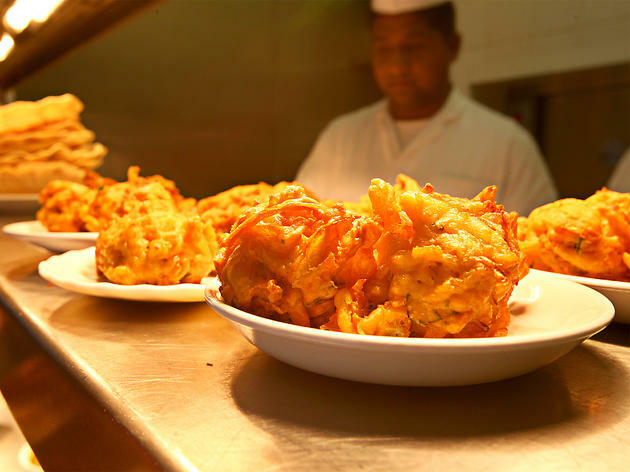 We recommend the freshly-prepared dishes: the curries (fish, mutton, veg, chicken) are all cooked home-style and sensitively spiced. The dahl is a comforting version, the turmeric-coloured toor dal giving body to the dish. Mounds of rice soak up the sauces; be warned that the pilau rice uses generous sprinklings of vivid food colourings. Although most of the dishes are North Indian in style, a soothing South Indian breakfast snack of dahi wada is a lentil rissole swathed in a heavy, palliative yoghurt. A sink for washing your hands afterwards is discreetly concealed behind a glass screen, not on public view in the Indian way. The Y’s better for lunch than dinner. I've heard about this place several times, it seems to be particularly popular indeed, especially among university students who are sometimes on a budget. The canteen has a pretty basic setting, very refectory-like style, thus, you might not be amazed by that; but for what concerns the food, it is absolutely great, it seems to be very authentic and is super cheap, believe me! You have a choice of rice (plain or pilau), the option of taking a Chapatti to eat with rice and Curry, a choice of several kinds of Curry (lamb, chicken, fish, egg and vegetable) and a choice of sauces. I had Pilau rice with Chicken Curry, Chapatti and a Mango sweet Lassi and paid 7.50£, which I found to be a quite reasonable price for what you get, as portions are very big (so I'd suggest you to go on an empty stomach or ask for a takeaway box for leftovers). I will surely be back to try the Prawn Curry, as it looks like a very interesting combination! Great food at a great price.... the best thing is you can choose your food at the serving counter and pay only for what you want to eat. Excellent taste and clean environment, Mutton curry and Fish curry are excellent. It is an YMCA in every sense of the word. It epitomizes the Village People's YMCA song. When you are short on dough, this is the place to go. They are not claiming Cordon Bleu cuisine. If you want to fill your stomach with delicious Indian food for less than 5 bucks, where else can you go? The curries are a bit 'meh' - at least, I've had the vegetarian curries and have found them to be a bit lacking in flavour - but well worth visiting in terms of value - it's hard to find anywhere this cheap to eat in central London. I've been about 4 times now and I am never disappointed. Some of the best Indian out there and at a reasonable price. You pay for what you take and i find it a bit more expensive than the other reviewers talk about, however, it's probably my choices. Its clean and friendly. I always feel comfortable there and will keep going back. For the price you pay the food is worth it. Not the best curry but pretty authentic. Don't make the mistake that everyone makes that i bring there and over order because it's so cheap! The fish curry is a particular fav of mine and I've never managed to try the egg curry, they are always sold out, perhaps because it's so popular. Friendly staff in a slightly canteen style setting. Been there a few times. 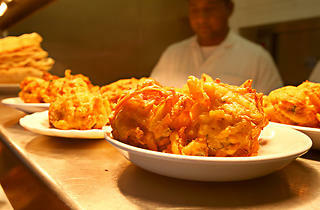 This is just for the undiluted experience of genuine indian food. Not for the ambience or expensive or "modified" indian food. The choice is restricted but a great tummy filler and value.